Board certified by the American Board of Plastic Surgery, Orange County cosmetic surgeon Dr. Michael Sundine has completed thousands of cosmetic and reconstructive procedures over his 23 year medical career. His Newport Beach-based practice specializes in facial aesthetics, especially facelifts, brow lifts, necklifts, rhinoplasty, secondary rhinoplasty, and breast augmentation. A graduate of the prestigious Duke University Medical Center, Dr. Sundine focuses on adult cosmetic surgery, specifically face lifts, secondary facelifting, browlifts, eyelid surgery surgery and rhinoplasty. Dr. Sundine also continues to provide care to children with facial birth defects. Details for Dr. Michael Sundine, M.D. 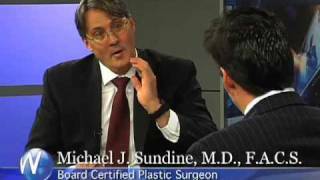 Patient Reviews Dr. Michael Sundine, M.D. Questions to Michael Sundine, M.D.